02:40 — Doctor Who: Live stage show touring UK. 04:48 — State of US Sci-Fi series – Cancelled and survived. 07:50 — TV clothes auction. 09:41 – Doctor Who: Amy’s Choice. 24:26 – Ashes to Ashes: Season 3, episode 7. 45:23 – Farewell for this podcast! 45:51 — End theme, disclaimer, copyright, etc. BBC News: Blackadder codpiece auctioned for £850. BBC: Doctor Who – Amy’s Choice. Adam J Purcell, Andy Simpkins and Keith Dunn sit down, moist with anticipation, in front of Doctor Who: The Vampires of Venice and spout our usual nonsense! BBC: Doctor Who – The Vampires of Venice. 02:21 — Doctor Who: BBC defends its decisions to send Matt Smith to Venice. 03:42 — Pulse: New series pilot created by Paul Cornell. 06:08 — International Towel Day on Tuesday 25th of May 2010. 07:28 – Doctor Who: The Vampires of Venice. 22:59 – Ashes to Ashes: Season 3, episode 6. 49:12 – Farewell for this podcast! 49:39 — End theme, disclaimer, copyright, etc. Adam J Purcell, Andy Simpkins and Keith Dunn sit down, agog, in front of Doctor Who: Flesh and Stone and spout our usual nonsense! 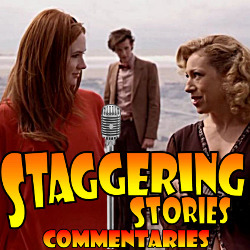 Yes, that’s two Commentaries today for the price of none. We held off publishing of The Time of Angels last week so that you can have both that and this together. If your podcatching software did pick up the previous commentary then you may have to tell it to manually download that one (some only automatically download the latest episode). BBC: Doctor Who – Flesh and Stone. Adam J Purcell, Andy Simpkins and Keith Dunn sit down, terrified, in front of Doctor Who: The Time of Angels and spout our usual nonsense! BBC: Doctor Who – The Time of Angels.